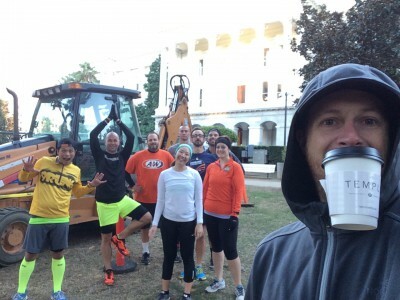 Okay no one really died, but we did have a new face show up to the workout this morning, who is named Kenny. After getting called out last week on the blog he did show up today. He even made the mistake of committing to next Wednesday’s workout. 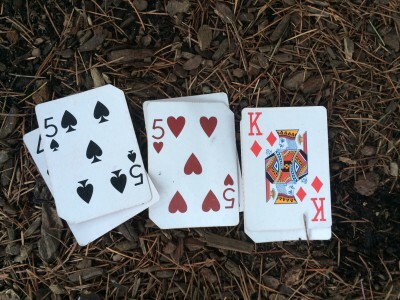 The workout today involved a deck of cards and a game called WAR. Yup today’s folks went head to head in the workout with the cards deciding the number of reps. If you won in the round you did 10 push-ups, 10 squat jumps and 10 v-ups … if you lost then it was 20 of each. However, the catch was this … each consecutive lose added 5 more of each movement to your total … Poor Ethan aka the ogre of the group ended up totaling like 40 of each at one point. Between each round a short run around a number of trees was incorporated. Kind of like this one ..
At the end of the workout we welcomed Kenny with “the tunnel”.